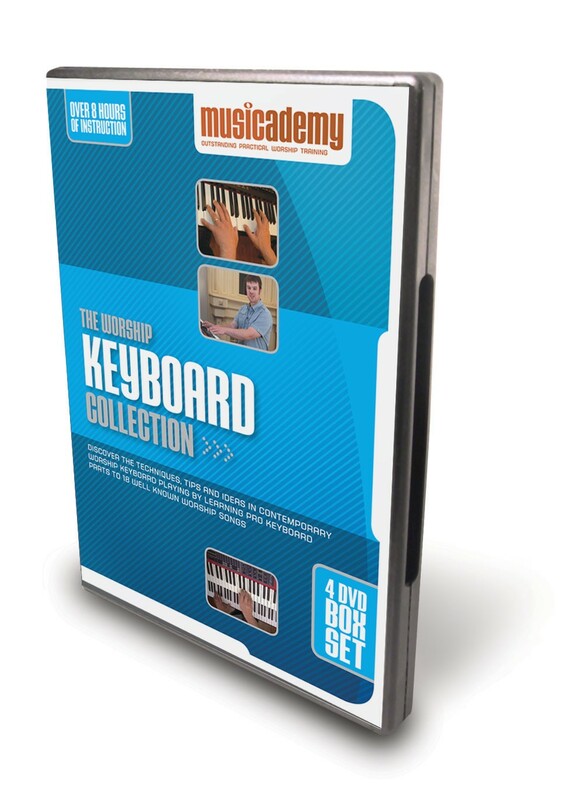 8 hours, 45 minutes of video lessons on 4 DVDs teaching the chord shapes, voicings, rhythms, fills, passing notes and textural sounds that pro players use to create keyboard parts in worship. All outworked in 18 well known worship songs. 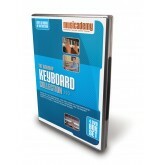 Includes over head camera close-up shots of the keyboard as well as great instruction from Musicademy's Tim Martin. Will the DVDs work in the US/UK/Australia etc? 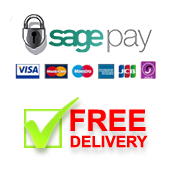 These 4 NTSC DVDs are formatted to play in any region, anywhere in the world. What playing level do I need to be at to access the learning in these DVDs? These lessons are aimed at existing players, not beginners. You will need to be relatively comfortable with playing with a chords-based method. 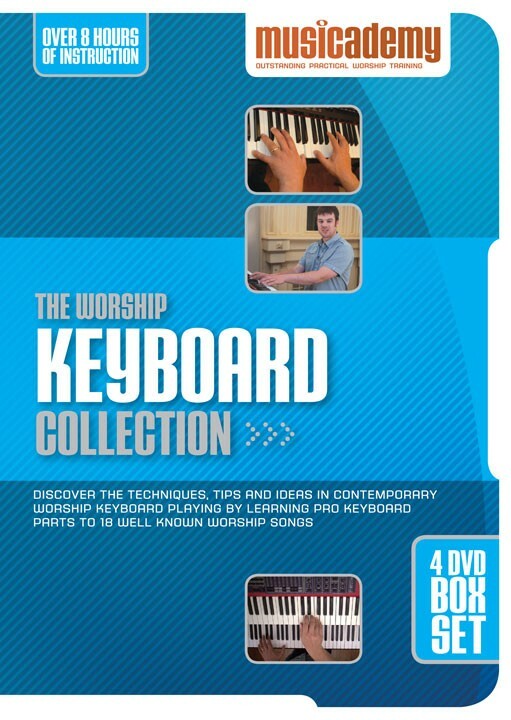 You can access lessons teaching this either on our Intermediate Keyboard DVDs, as downloadable lessons or pick it up as you go through the Worship Keyboard Collection. The 18 lessons on the Worship Keyboard Collection do vary in terms of difficulty. 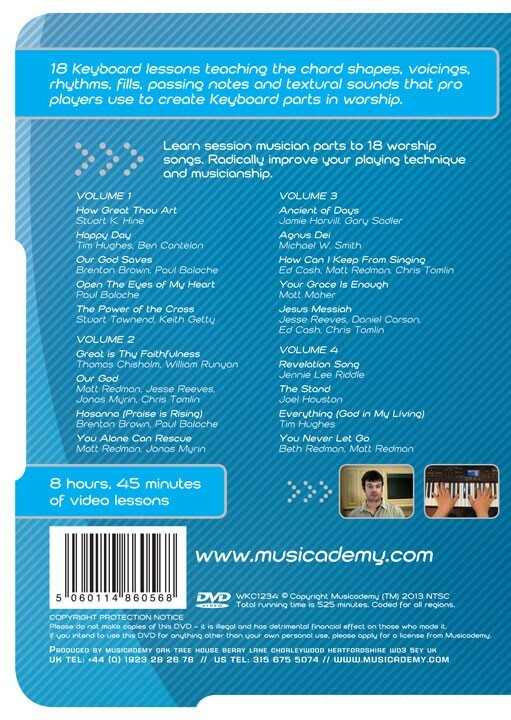 If you can follow along a music score to a worship song or chord chart and you have enough basic piano skills to play simple versions of worship songs then there will be plenty of learning on these DVDs for you. More intermediate level players will also find plenty of new tips and techniques to add to their repertoire. I am very interested in what you are doing to improve the musical side of worship in our churches. I am a 77 yr old pipe organist (now of necessity a keyboard player – no pipe organ!) steeped in Charles Wesley, Isaac Watts et al, but I also love the best of what has been written in the last few decades of which I would put the songs by Stuart Townend and Graham Kendrick among the very best. I thought the training and playing by your team was absolutely brilliant when they cam to Christ Church Bristol many moons ago, which is where I bought some keyboard DVD’s and signed up for your newsletters. So do please keep them coming. May our Heavenly Father continue to bless and prosper you in your work.